See the best of Jaipur on this incredible sightseeing day tour. Tour the Amer, Jaigarh and Nahargarh Forts and explore the galleries of the Albert Museum. Get insight into history and traditions during a stop at the City Palace and the Palace of Winds and check out the beautiful Sisodia Rani Garden. This tour even includes a visit with the former royal family of Salwar and a traditional Indian dinner in a castle. Very knowledgeable guide and good driver. Only visited 2 forts - guide said the other forts were not that interesting. Lunch and dinner were both really nice. Since I was a solo traveler, manager Deepak ate with me at the castle, and entertained me with stories about the castle and village. I had a really great experience during my Jaipur Sightseeing Day Tour. Both the guide Ali and the Drive Yokush were really responsible and attentive. 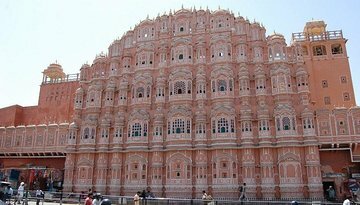 In the morning, we visited the Pink City, the Hawa Mahal, and the Amber Fort. For me, Amber Fort was a really unique moment due to the elephant ride experience and the beauty of the palaces the guide Ali knows evrything about it. We had an average lunch at a hotel and then Ali gave me options to build our afternoon trip, pointing out the advantages and disadvantages of each place, which I found really helpful. Just as an example, I chose visiting between the the Monkey Temples, instead of the City of Palace which I was able to visit in the other day by myself. At the end of the day, we were blessed to see a wonderful sunset at the Nahagargh Fort. Finally, for those who want to shopping, he knows very good places to visit. Thank you all for my incredible experience!! Pésimo. Imposible hacer en un solo día. Great tour - quite comprehensive and smoothly executed.